The rankings have been overturned! The top seeds in the East are out and the Conference final pits 5th-placed Avangard against 6th-placed Salavat Yulaev. Bob Hartley’s team wrapped up its series against Barys in five games with a 5-3 win in Astana, reaching the final for the first time since 2012. Salavat Yulaev defeated regular season top dog Avtomobilist to continue its progress. A second period surge and another mighty Maxim Chudinov shot was enough to finish off this series in Avangard’s favor. Barys battled hard and looked capable of taking the action to Balashikha once again when it opened a 2-0 lead early in the middle frame. But the visitor hit back to take control with four goals in that second session and sealed a 4-1 series win when Chudinov scored from deep in his own half once again. Chudinov’s super strike was just one of Tuesday’s talking points: the heavy hits handed out by Avangard Viktor Svedberg and Barys’ Darren Dietz also kept the commentators busy. Both players were suspended for this game but while Dietz’ victim, Sergei Shumakov, was fit to play for Avangard, the home team was without Valery Orekhov following that crunching blow from the visitor’s Swede. Andrei Skabelka raided the club’s reserves for replacements: Samat Daniyar made his KHL debut and Madiyar Ibraibekov suited up for only the second team. Avangard brought Max Talbot back in place of Svedberg. Barys led the way in the first period. The home team made a bright start and had already hit the post before taking the lead midway through the period. Brandon Bochenski’s shot was saved but Matthew Frattin was alert to the rebound to give his team a deserved lead. The same pair combined again seconds into the middle frame as Frattin converted a 2-on-1 break to give Barys a two-goal advantage and boost home hopes of prolonging the series. Back came Avangard. Two goals in a minute saw Nikita Pivtsakin and Kirill Petrov wipe out that lead. Pivtsakin got things rolling with a meaty slap shot after Dominik Hrachovina made an impressive stick save to stop Ansel Galimov’s pass finding the net via a defenseman’s skate. Petrov tied it up with a close-range finish after Talbot sought a gap on the wraparound. Next, two power play goals in quick succession late in the frame saw the visitor build a 4-2 lead. Taylor Beck converted his team’s first power play in the 36th minute and within 90 seconds he had an assist as Sergei Shirokov made it four. Beck made it eight games in a row among the points; Avangard has only played nine in post season so far. That spelled the end for Hrachovina but his replacement, Henrik Karlsson, was about to come face-to-face with an all-too-recent nightmare. On Tuesday, the Swede was beaten by a Chudinov shot from the defenseman’s own blue line. 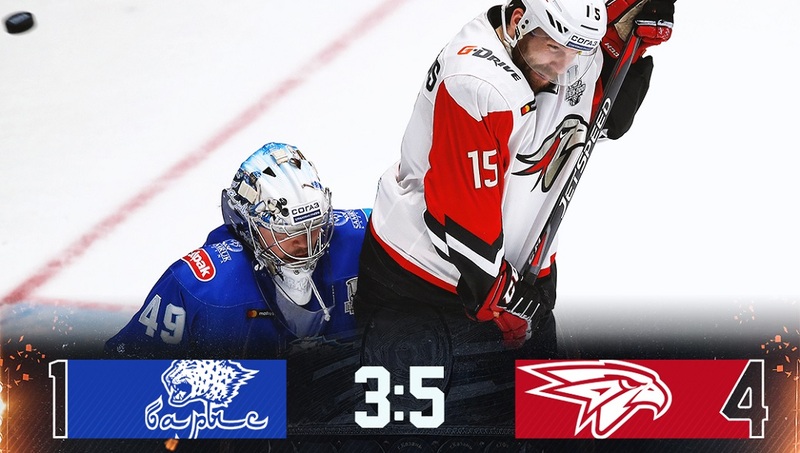 Today, the Avangard man fired in another effort from the same spot and history repeated itself: a skidding effort bamboozled the goalie once again and Avangard had a 5-2 lead. That effectively ended the game as a contest and the heat went out of it at both ends of the ice. Barys mustered a consolation goal in the last minute through Nikita Mikhailis, but it would prove to be the final act of the Kazakh team’s season. Avangard moves to the Conference final for only the second time in its KHL history: last time, in 2012, the Hawks made it all the way to the Gagarin Cup final. I’d like to thank Avangard for a great series. My only regret is that we were beaten, in effect, in a battle of the special teams. We couldn’t come to terms with their power play and, in addition, we were unable to put out our strongest roster. It’s disappointing that the series and the season are over for us. But it wasn’t a bad season, especially when you take into account where we started. This Barys team was built almost from nothing. I don’t think that anyone would have looked at our preseason preparations and anticipated that this would a team that progress assuredly through the season without any real glitches. Once again, I’d like to thank our team and our fans for the season. To make a brief summary, our Petersson-Cormier-Starchenko line, which won us several games in the regular season, never got a chance to show what it could do in the playoffs. We also missed Kevin Dallman. Yes, he’s an older player, but much of our power play is built around him and in regular season we had two good special teams. That team never appeared in the playoffs but I think we will come back stronger. I want to congratulate Barys on a great season. This wasn’t an easy series for either team, we both suffered injuries. As for today’s game, we were in a tough spot when we allowed that second goal. But I have to thank our guys for the way that got back into the game so quickly. We scored two at equal strength then two more on the power play and that was the turning point in the game. After that, nobody eased off, everyone battled to the end and that’s why we deserved the win. I’d like to say a big ‘thank you’ to the Barys fans and the Avangard fans who came from Omsk to support us. It’s an excellent stadium and a terrific atmosphere. Salavat Yulaev’s Nordic front line was on top form as Nikolai Tsulygin’s team powered into the Conference final with a comfortable win over Avtomobilist. The game – and the series – finished 4-1 to Ufa, with three points for Teemu Hartikainen and two for Joonas Kemppainen leading the way. Their line-mate Linus Omark also got a goal, while Finnish netminder Juha Metsola made 35 saves as Avto’s offense spluttered and failed. The visitor’s fast start went a long way towards deciding this game in the opening minutes. Hartikainen opened the scoring after 62 seconds, tapping the puck into an open net after Grigory Panin’s point shot was redirected by Kemppainen. Avto’s problems got worse when it took a penalty in the fourth minute and Salavat Yulaev duly took advantage. Hartikainen was involved again as a Philip Larsen shot deflected into the path of Vladimir Tkachyov to make it 2-0. As if to underline the point that today’s bounces were going the visitor’s way, Avtomobilist defenseman Nikita Tryamkin smashed in a shot of his own. It came back off the boards but there was no home forward on the slot to take advantage and Salavat Yulaev quickly neutralized the threat. The home task got even harder late in the first period when Stephane Da Costa was removed from the game for slashing at Hartikainen. The Frenchman’s angry swipe was right under the nose of the official; he left the game fuming and crashing his stick against the glass. Admittedly, the penalty was soon cancelled out: Alexander Burmistrov received a similar penalty for a similar offense within a minute, inexplicably sliding his stick between Anatoly Golyshev’s legs as Avtomobilist was pushed into its own zone. However, the long-term damage was done by Da Costa’s departure. With the home team in urgent need of goals, losing a first-line center in the first period was a big blow. A couple of incidents midway through the second period served to reinforce the feeling that this would not be Avtomobilist’s day. Juha Metsola, impressive in goal once again, made a fine stick save to deny Evgeny Chesalin. Play went to the other end of the ice and Hartikainen left Jakub Kovar sprawled on the ice. The Finn’s shot clipped the outside of the post but Kemppainen brought it around the back and set up Linus Omark for the 3-0 goal while the home goalie struggled to recover. Early in the third, Hartikainen again prised open the home defense. This time he saw his shot blocked, retrieved the puck from the attentions of Avtomobilist’s players and fed Kemppainen for Salavat Yulaev’s fourth. The game was done, although the home team managed one moment of cheer in the 52nd minute when Chesalin followed up a Mikhail Mamkin point shot and beat Metsola at last. It was, however, too late to save the game. 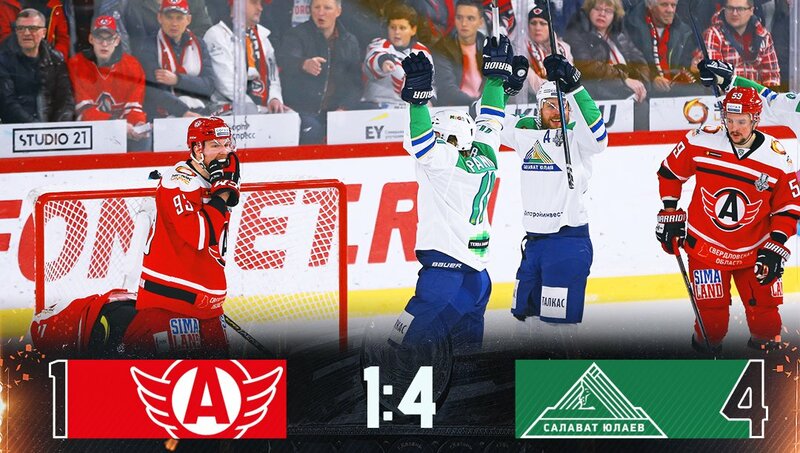 Avtomobilist’s best ever playoff run comes to an end in the Conference semi-final; Salavat Yulaev moves to the Conference final for the fifth time, and the first since 2016’s defeat against Metallurg Magnitogorsk. Alongside an impressive team performance, Hartikainen scored his 113th goal for the club, equalling Ilya Grigorenko’s record in the KHL. The Finn also picked up two helpers to join Nikita Gusev at the top of the playoff scoring chart with 14 (6+8) points. If we talk about today’s game, we got a great start. We were ready for this game, we set out knowing it could be decisive and from the first shift we battled away and got the goals we needed. That’s all down to fully committed team play. Everyone played a part, even the guys who only trained with the team and never got on the ice. Everyone was part of the team. It was a really tough series. Avtomobilist has great forwards and we had to withstand a lot of pressure. Unfortunately we lost every game when we conceded first. After that we had to keep pushing forward and we were left exposed at the back. The opposition caught us on the counter attack and we got nervous. These things happen. I’d like to thank everyone for their efforts and support during the season. Salavat was really well organized at both ends. The goalie, Metsola, is the best in the league at this stage. They shut down our key players, they didn’t give us space to make decisions. Ufa played a well-organized game, you could feel the coaches’ hand in that.